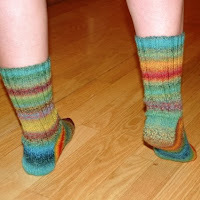 Tracie's Ramblings: 8 stitch socks are finished! 8 stitch socks are finished! 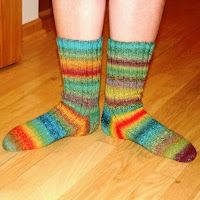 I have finished the socks for me! I did the same ribbing on the leg and top of the foot but on this sock I stopped at the toe decreases. I like it better than the first sock I did and it was much easier to just concentrate on the decreases instead of the ribbing AND decreases. I did the 3 needle bind off as well. I promise the next pair I'll try harder to do the kitchener. I have quite a bit of yarn left, hmmmm what to do.